The winter which ended 1914 was bitter, foul, thoroughly dispiriting, and it didn’t improve into 1915. 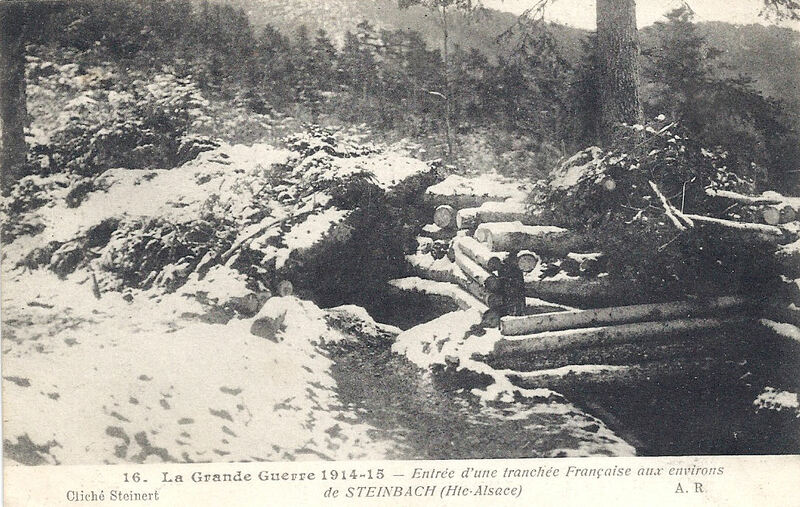 The French-American academic Robert Pellissier spent some time in the Vosges as part of a contingent attacking Steinbach (that is, coming down already disadvantaged from the frozen Vosges mountains to the German-held, well-supported areas on the plain). Having just read his letters*, I was taken by the irony of the text of this postcard in my collection, which was sent to a M. Nouvelloy in Paris. Very happy for your card. I always hope that you three are in good health. I’m sending you the main entrance to my bedroom. Best wishes to you. And soon I hope to shake your hand.